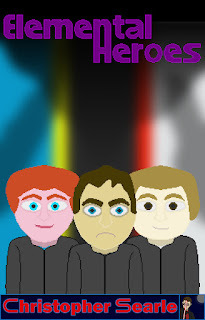 Elemental Heroes has been a series concept since around December/2006 as just a twenty slide Powerpoint story. Space Race Championship didn’t follow until around January/2009. Of the two, though, it was Space Race Championship that got the most attention. Elemental Heroes felt a very one and done deal – even if I had very briefly started on a sequel around May/2007. However, twenty slides seems a bit too little to be turning into a full story, so it sat on my storage for ten years not being touched. The idea of the world was too much to pass up – even if there was little to it. Bit by bit I gleaned everything I could, reworking and expanding everything. Characters, the world, even the elements themselves. Then there was the fact that – as I’ve said – twenty slides is a bit too little to be turning into a full story. The story as presented in that Powerpoint is easily told in a paragraph. It’s Halloween, and five teenagers get arrested for something they didn’t do. In the cell they wait, they find five stones and get launched into the world of being Power Rang- I mean police force members. 2006 was the year of Power Rangers SPD, remember, and Dino Thunder still would have been in my mind at the time. Those five teenagers are recruited into the force, do battle against a witch named Darcy and her sidekick Draco, and stop her collecting the elemental powers the force possesses. Very Rangers inspired, with the elemental powers coming from Pokémon types and moves. It focused on a few battles and felt very much like a very condensed season of Rangers. A few names were taken from Rangers, such as Brandon and Sky, with others coming from other cartoons of the times [or at least inspired by them]. When planning started on expanding everything, the names of those characters would be changing. Max became Martin. Sky became Kieron. Sally became Emma. Brandon… stayed the same, though the meaning of the name changed. Just as there was a Brandon Golden in the Alternate Halesowen and Beyond series, so there became a Brandon Golden in the Elemental Heroes series. This version of Brandon borrows very little from me as a person, though perhaps is favoured more than the others. With the characters defined, I then did the same with the world, building it up to create a lot of the rules it obeys. From the start I wanted it to be in episode format rather than naming them chapters. A hold-out of the fact I still wanted the Rangers feel within. I wasn’t going to go through an entire forty episodes in one book, but build arcs that were defined by the book. The first seven episodes introduced the mechanics of the world, who the heroes and villains were, and a bit of history as well. The opening episode was changed to have the three prospective force members already be in training. They show their skill to earn being picked for the team. And note that the number has dropped. Another hold-out to Rangers – specifically Dino Thunder – was to not have the full team together at the start, but build it up. However, I was messing with the team dynamics all through the seven episodes to see how the characters would react. At the end of the first arc, the team stands at four of five. The world had taken on a more videogame-like outlook, so I used that to the full. As such, the main villain of Darcy controls very videogame-like creatures such as those found in Kingdom Hearts. I separated Draco from her to become an individual character in his own right, with his own history that gets explored here. The first few missions also play out differently between the two versions. In the original Powerpoint version, the team are instantly ready to deal with Darcy being who they fight. With the full version, the team don’t even have their elements to hand as they are called to aid the primary unit. The second battle involves just the two leaders. Both of those battles are against a few of those creatures. And speaking of leaders, in the original version it is Brandon who was the leader, but I settled for Kieron in the full version as I felt this version of Brandon was better suited to not be constrained by the leadership role. The capture of the commander – Gary – moved up the field a few episodes from the original version. In that original version, he’s captured just because. Whereas the full version gives a reason in line with the history on display. Instead, the full version explores the elements and builds up more of the world. It also introduces the fourth member of the team before the story hits the point Gary is captured. The original version then decided to end… weirdly. Evil was still around yet a break was had from fighting. Competitions were held and a holiday to Benidorm won. Christmas and New Year’s parties held, and the next fight with Darcy didn’t take place until February. However, before that took place, the battle with Draco was held. This entire section of the story involved Draco leaving Darcy and mind-controlling the regular citizenry to become his soldiers. Unfortunately, that part of the original version is the weakest of the lot, and wouldn’t have worked with the new history and character of Draco. It was also weak because the team faced no morality about the fact they were defeating the regular folk of the city they lived. In the full version, episode six sees Gary captured and rescued, with the seventh being the victory Darcy been looking for, only to have it wiped from her. That episode was meant to be a two-part episode, but when I got to writing it, there simply wasn’t enough material to split it into two parts. Besides, it’s not like that was the final end. The sequel of the original version would have involved time travel. Now isn’t that a fun topic to go into. Darcy would have created the time element to send the team back to the time when her sisters were powerful. I don’t need to be using this at all, but the concept of Darcy having sisters – like all the ideas from the original version – got expanded and hinted at the end of the full version. The second arc of the full version will be detailing all that. So far, only a quarter of this entire story has been planned, but I know who the characters are and where they are headed. Since I already have forty episodes pegged total [though that might have to drop a few] I know roughly how many episodes per arc I want. I also know roughly what those arcs will be, with the second arc exploring more of the world and of Darcy, then three more arcs after it. By the time of the final arc, all the elements will be shown off. If this look into the planning has you wanting to check this ebook out, you can find Elemental Heroes here [UK link], and all my other ebooks from the sidebar - which will take you to my Amazon Author Page.